I am so excited to tell you about this gorgeous product! I received this to trial a while back (I'm bad with time, I can't remember exactly when) and I was thrilled. I have been developing a little obsession for makeup artist's brands - Beaute, Real Techniques, and of course, Jemma Kidd. The Mannequin Skin Complexion Enhancer is basically a face primer. But boy, does it do way more! The product comes in a little toothpaste-like squeezy tube, and dispenses the most gorgeous true-gold liquid, infused with micro particles of brilliant golden shimmer. The liquid itself is quite fluid, so it spreads onto the face very easily. As far as maintaining long-lasting makeup, this primer does pretty decently, but its performance in this task is nothing phenomenal. What is phenomenal is its ability to make the skin look glowing, healthy and lit-from-within, which is a major plus for me. Foundation alone (left), and foundation applied on top of the Mannequin Skin Complexion Enhancer (right). A makeup look done using the complexion enhancer. For the tutorial, check out this post. LOOK at the awesomeness that is this highlighter! I also tried this product layered on top of makeup, and it is absolute perfection! It functions as a gorgeous highlighter, and is really easy to apply - just dab onto your face with your finger and blend. The result? A serious J-Lo glow. I recommend using this product on top of a pore-covering primer if you have large pores and imperfections, because this primer isn't too heavy duty. It does cover smaller imperfections well, but not the larger pores I have at the base of my nose. 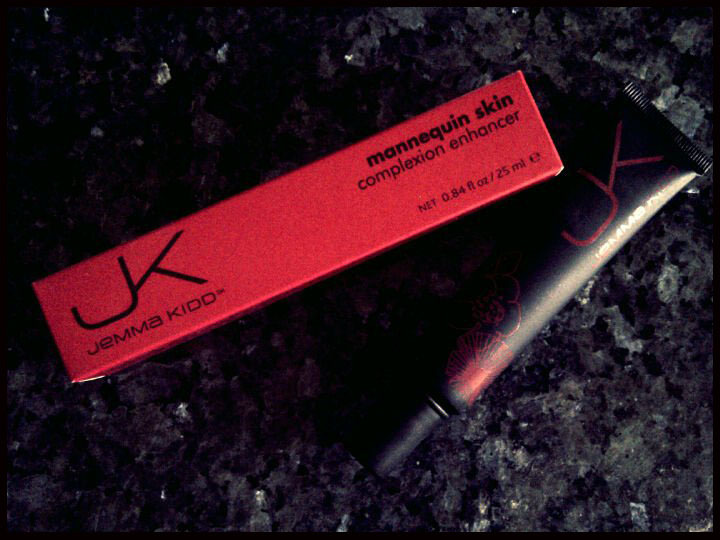 The JK Jemma Kidd Mannequin Skin Complexion Enhancer retails for AUD 35.95 at Kit Cosmetics. I have my eye on quite a few more JK products. If you're also interested in the JK line, check out Kit Cosmetics' Jemma Kidd page here.